Toe sprains result from partial tears to the ligaments in your toe. These ligaments connect one bone to the next. You can sprain a toe by stubbing it on a hard object or even by stepping and stopping abruptly, forcing the toe into the end of your shoe. Toe sprains to the big toe can be debilitating and keep you from walking without the use of crutches or a walking boot. You might suffer from severe pain as well as swelling and bruising on the toe. Although toe sprains heal on their own over time, several at-home treatments can be applied. Stay off your feet as much as possible. 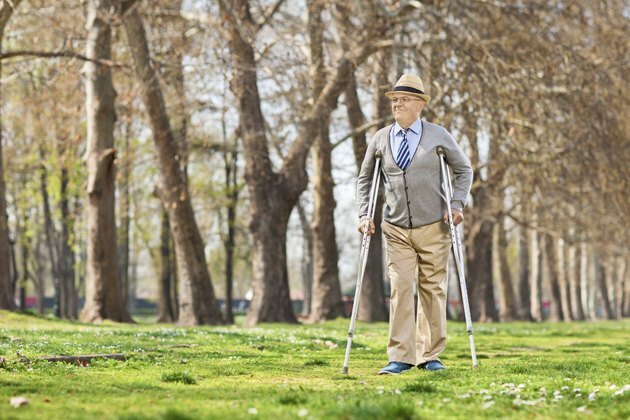 Use a walking aid when possible to lighten the stress placed on your sprained toe. Wrap ice cubes or a cold pack in a washcloth, and apply it to the toe several times daily for 15 to 20 minutes at a time. Wrap a compression bandage around the big toe to reduce swelling. Other toes are too small for a compression bandage, because it can cut off circulation in them, but the big toe is large enough that a compression bandage can be useful. Wrap the bandage tightly so that pressure is applied to the swelling in your toe. Elevate your injured foot above your heart whenever possible for the first 48 hours. This will help fluids drain from the toe, reducing swelling. Take medications to reduce inflammation and pain in your toe. Pain-relief medications that can be beneficial include ibuprofen, naproxen, acetaminophen or aspirin. Do not take these medications in combination with one another. Sometimes a toe fracture can be misidentified as a sprained big toe. Visit a doctor to have the severity of the injury assessed. Follow instructions provided on the medication packaging.